IMF Managing Director Dominique Strauss-Kahn has welcomed the $700 billion US bail-out package to address the crisis which has seen the collapse of major private financial institutions. Khan said the U.S. administration first thought it could decide on a case-by-case basis and that’s what it did in the cases of investment banks Bear Stearns and Lehman Brothers, and with Freddie Mac and Fannie Mae, and insurance giant AIG. 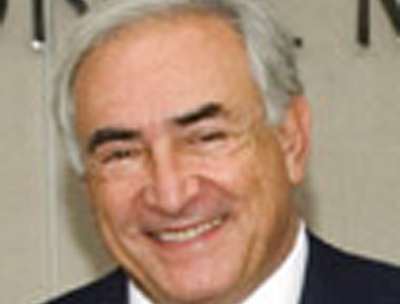 Q: Mr. Strauss-Kahn, the U.S. financial system is close to collapsing. Banks are being nationalized and taxpayers are expected to bail out Wall Street with billions. Is this the end of the free market economy? A: Not at all. I believe that the market economy will emerge strengthened from this crisis. The free market economy needs regulations, a framework to function, and as soon as the immediate danger of a symstemic crisis is over, new regulations will strengthen the financial system and thereby the market economy, and reduce the risks of market failures. Q: How did it come to this in the first place? A: At the core of the problem were falling house prices in the U.S. and the resulting loss in the value of securities linked to mortgage liabilities. But the origins can also be found in the fact that regulation and supervision were not strict enough to thwart the weakening of criteria for credit provisions. Too many risky mortgages were approved. It worked for a while, and led to high earnings, but in the end, this carelessness led to the crisis. Q: How could this have been avoided? A: Regulation in the U.S. did not keep up with the rapid developments on financial markets. Government supervision is too fragmented; and it seems that the necessity for a new order, for a new financial architecture, was not recognized early enough. Q: Should Congress have limited Freddie Mac and Fannie Mae? A: The structure of the two companies was indeed a little unusual. On one hand, there were private shareholders expecting profits, on the other, there was the public mandate to support house ownership in the U.S. Investors always knew that if the worse came to worst, the government would cover for it. That certainly contributed to the problem of excessive lending. Q: As during previous crises, the ratings agencies do not look very good. A: Indeed. The credit ratings by the agencies are almost like a public good. They provide guidance to many market participants and play an important role for global capital flows. We will have to consider how ratings agencies can be encouraged to operate more effectively. Q: What do you think about the bail-out package for the banks that is currently being put together in Washington? A: It is rather urgent to find a solution for this systemic crisis. In that regard, we welcome those plans. The U.S. administration first thought it could decide on a case-by-case basis. And that’s what it did in the cases of investment banks Bear Stearns and Lehman Brothers, and with Freddie Mac and Fannie Mae, and insurance giant AIG. But then it realized that this would not suffice and it came up with the plan it is now putting together with the Congress. A few months ago, the IMF had pointed out that a systemic solution was needed. In the spring, we dared to forecast that the loss of financial institutions from the subprime crisis would cost more than US$1 trillion, and we were strongly criticized for that projection. Q: The G7 supports Treasury Secretary Paulson’s plans. At the same time, members reject suggestions to clean up their own banks from toxic assets. What’s your view? A: We should not forget that in the first instance, this is a U.S. crisis and that most of the losses are occurring in the U.S. That’s why the U.S. is primarily the one tasked with crisis management. Although European banks have also experienced losses as a result of their engagement with securities linked to the U.S. housing market, they are overall in a better position than U.S. institutions. Nevertheless, the Europeans should not be complacent and should be prepared for the worst-case-scenario. Q: How do you view the future of the financial sector? A: The restructuring process currently underway has not come to an end. The financial sector and its importance for the economy will shrink. There is currently a kind of correction of previous excesses: Financial markets and institutions have grown much more rapidly than the economy as a whole. In the U.S., the model of an independent investment bank has failed. Of course, investment banks will continue to exist, but they will be part of universal banks. Q: What does this mean for Europe? A: In that sense, Europe is in a better position and less vulnerable. The focus in Europe was not as much on investment banking as it was in the U.S. Investment banking is already part of universal banks—a concept which is now developing in the U.S.
Q: The U.S. debt is high and it will climb further. How long is this sustainable? A: It’s true that at first, the debt will rise for a while. But it is possible that taxpayers will get their money back one day if the government sells the securities it took over for profit. If that does not succeed, it will be inevitable for policymakers to take fiscal measures. Q: The current crisis differs from previous ones mostly in that private market participants and not governments have gotten in trouble. What does this mean for the work of the Fund? A: Indeed, we are not in demand at the moment to provide loans because so far we have not had any of our member countries face a balance of payments crisis. The dollar has not experienced dangerous pressures while the crisis intensified. However, should any balance of payments problems emerge, the IMF, of course, stands ready to help. Until then, we continue to analyze and provide advice. Q: The IMF already applauded the U.S. administration this year when it came up with a billion-dollar stimulus package. Why did you not voice any criticism when this old-style Keynesian tool was used? A: Because Keynesian policies can sometimes have a positive effect! The fact that the U.S. economy remained relatively robust amid strong financial market turmoil was also the result of the domestic demand boost prompted by the tax refund. Q: Will the global economy drift into recession now? A: We already had a pessimistic forecast last spring, in particular for the U.S. We were also criticized for that. Now it goes to show that we were right. I think the reason for that is not in the least the fact that we—unlike any other organization—incorporate financial market developments into our forecasting. The way it looks at the moment, neither the U.S. nor the global economy will drift into recession. But we see a protracted economic slowdown and even the recovery we expect next year, will be sluggish. Interveiw conducted by Claus Tigges.